Following on in our #MiniSeries, we’re now going to share a selection of our Porsche GT racing photos spanning the years 2005 to 2008. But because there is just such a wide variety of fascinating imagery in this genre, it will be covered in two parts. FIA GT race, Silverstone, 15 May 2005: (left) The #55 Embassy Racing Porsche 996 GT3 RSR of Neil Cunningham/Ben Collins (ex-Stig from BBC Top Gear) finished 13th. Cunningham doubled for James Bond in the movie Quantum of Solace, and now lives in Swansea. (right) The #66 Gruppe M Racing Porsche 996 GT3 RSR was ably piloted by Marc Lieb/Mike Rockenfeller, who finished 9th and first in GT2 (five laps behind the winner). Both Lieb and Rockenfeller of course went on to great success with the Porsche and Audi works teams respectively. Silverstone 1,000km, 13 August 2005: (left) The #86 Noble Racing 996 GT3 RSR of Darryl O’Young (HK)/Matthew Marsh (GB) failed to finish due to gearbox problems. (right) Gruppe M Racing 996 GT3 R driven by the British pairing of Jonny Cocker/Tim Sugden was involved in an accident during the wet race. Introduced in 2004, the Porsche 911 GT3 RSR (Type 996) featured a 3598cc water-cooled flat-six engine developing 445bhp at 8250rpm, up from the 2001 model 911 GT3 RS’s 415bhp at 8200rpm. Maximum engine speed is reached at 8500rpm when fitted with twin FIA spec 30.8 mm air restrictors. This model was run for three seasons, 2004 to 2006, being replaced by the Type 997 in 2007. The 996 GT3 Cup Car, the first racing car to usher in the new era of water-cooled Porsches back in 1999, could be upgraded to 400bhp at 7300rpm from its 3.6-litre engine, and had a sub-4 second time for the 0-62mph sprint. 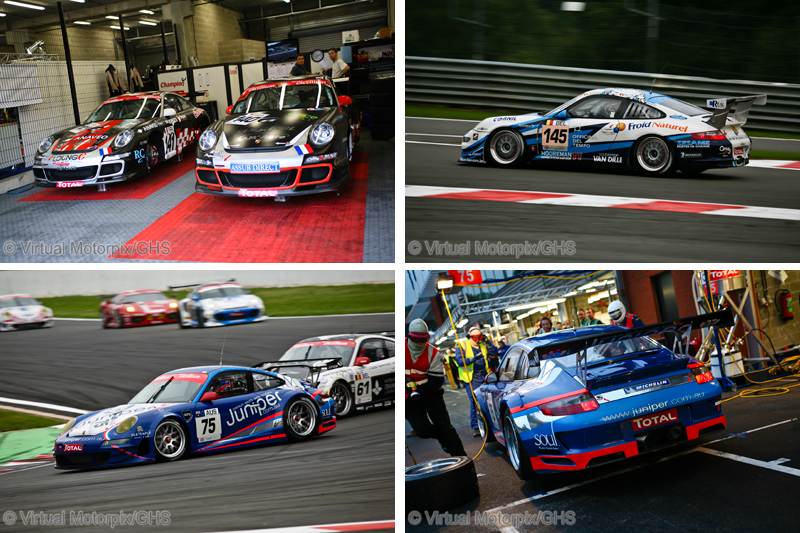 European GT3 Championship, Silverstone: The #5 SOFREV Auto Sport Promotion Porsche 997 GT3 Cup is seen prior to the race. Jean Beaubelique/Gilles Chatelain finished 35th in this car, while the #6 SOFREV sister car driven by Marc Cattaneo/Morgan Moullin-Traffort finished 5th overall, winning the second heat. FIA GT RAC Tourist Trophy, Silverstone: (left) The #74 Ebimotors 996 GT3 RSR driven by the Italian duo Luigi Moccia/Emanuele Busnelli did not finish after qualifying in 20th place. (right) Porsche regulars Christian Ried/Horst Felbermayr, Jr. in the #66 Team Felbermayr-Proton 996 GT3 RSR finished 17th overall (10 laps behind the winner). Available from 2006-2009, the 911 GT3 Cup Type 997 MK1 was powered by a 3.6 litre flat-six, producing 400bhp at 7,300rpm. With a revised aero package, the 997 GT3 Cup Car generated 40% more downforce than the 996 GT3 Cup Car, predominantly through its wider and higher rear wing. All 997 GT3 Cup cars were fitted with the Porsche sequential gearbox. Originally introduced in the 2005 Porsche Supercup, more than 1,400 cars were produced during these years making the Porsche 997 GT3 Cup Car the bestselling racing car of all time. For this photo grouping, both the European GT3 Championship and the FIA GT RAC Tourist Trophy were held on the same bill at Silverstone on 7 May 2006. FIA GT Championships, Silverstone: (left) The #97 3.8-litre BMS Scuderia Italia Porsche 997 GT3 RSR of Matteo Malucelli/Emmanuel Collard finished 18th overall, four laps behind the winner. Obscured behind is the #99 Tech9 Motorsport Porsche 997 GT3 RSR driven by Sean Edwards/Leo Machitski who finished two places back in 20th. Readers will remember Sean Edwards as the very talented Carrera Cup driver who was so tragically killed in Australia in October 2013 in a private testing incident. (right) Marcello Zani/Emanuele Busnelli in the #74 Ebimotors Porsche GT3 RSR did not finish. In 2007, the weapon of choice was the new Porsche 911 GT3 RSR. Powered by a new 3795cc flat-six, the RSR produced 485bhp at 8400rpm when fitted with two 30.0mm restrictors. The engine boasted 4-valves per cylinder, a compression ratio of 14.5:1, and redlined at 9000rpm and was driven through a sequential 6-speed ‘box. For once we had a dry race for the FIA GT Championships at Silverstone on 6 May. When the #74 Ebimotors Porsche 997 GT3 RSR came past with its door missing, it presented a great opportunity to see the driver hard at work behind the wheel. Although the driver would not have enjoyed having his door missing, this can be a common sight at races as the pressure build-up inside the cockpit can be significant, and just hitting a bump can ‘blow’ the door outwards and into the long grass. A missing door also has a significantly negative impact on the aerodynamics of the car. Le Mans 24-Hour, 2007: (left) The #93 Autorlando Sport Porsche 997 GT3 RSR of Allan Simonsen/Pierre Ehret/Lars Nielsen finished in 21st place. Readers will recall that the Dane, Allan Simonsen, lost his life at Le Mans in 2013 when his Aston Martin struck the barriers at Tertre Rouge on just the third lap. (right) The #76 IMSA Performance Matmut Porsche 997 GT3 RSR driven by Porsche regulars Richard Lietz/Raymond Narac/Patrick Long finished 15th place overall and first in the GT2 class, 49 laps behind the winner. The Le Mans 24-Hour race on 16/17 June 2007 was indeed an action packed race. Just a few hours after the start of the race, the storm clouds that had been steadily building suddenly decided to empty, and the deluge that followed saw all and sundry scattering for whatever cover they could find. Mike Rockenfeller fell victim to the conditions and in the process clobbered the Armco at Tertre Rouge. A lengthy safety car session ensued. Thankfully he was fine, the skies cleared, and the race was green flagged once again. This race saw the last time for the Seikel Porsche team at Le Mans 24-Hour event, having participated 11 times, but this would not be a happy race for them as the car retired after just 68 laps. Spa 24-Hour, 2 August 2008: (top left) The #140 Emeraude Racing Porsche 997 GT3 Cup S driven by the all-French team of Olivier Baron/Patrice Fournet/André-Alain Corbel/Manuel Ferreira qualified in 41st place but posted a DNF in the race. The #141 sister car piloted by Rémy Brouard/Thierry Stépec/Philippe Nozière/Tony Samon finished in 20th place overall, 109 laps behind the winner. (top right) Driving a Porsche 997 GT3 Cup S (#145), the all-Belgian crew of François Duval/Christian Kelders/Philippe Greich/Christophe Kerkhove came home in 18th place. (bottom left & right) From the southern hemisphere, the Australian Juniper Racing team with the #75 Porsche 997 GT3 RSR finished in 19th place in the hands of Shaun Juniper/Max Twigg/Craig Baird/Rodney Forbes. Seen here (left), the car rounds Le Source at the start of the race, while (right) the car stops in the pits during the evening hours. Porsche’s 2008 GT3 RSR was aimed at the GT2 class in international long distance racing. The most distinguishing feature of the new GT3 RSR was the new front end treatment which carried major improvements to the aerodynamics including additional spoilers on the front apron, so-called flicks, an optimised air ducting with newly-designed side air outlets which generated greater downforce and reduced drag. The rear wing was taken over from the predecessor. The 3.8-litre engine remained unchanged from the previous year apart from slight improvements to some details, and delivered the same 465bhp at 8000rpm, the rev limiter kicking in at 9400rpm. Much of the technology in the GT3 RSR’s new sequential six-speed gearbox came from the RS Spyder sports prototype, and was considerably lighter than its predecessor. If you’re tempted, you could have a GT3 RSR for €349,800 plus VAT. 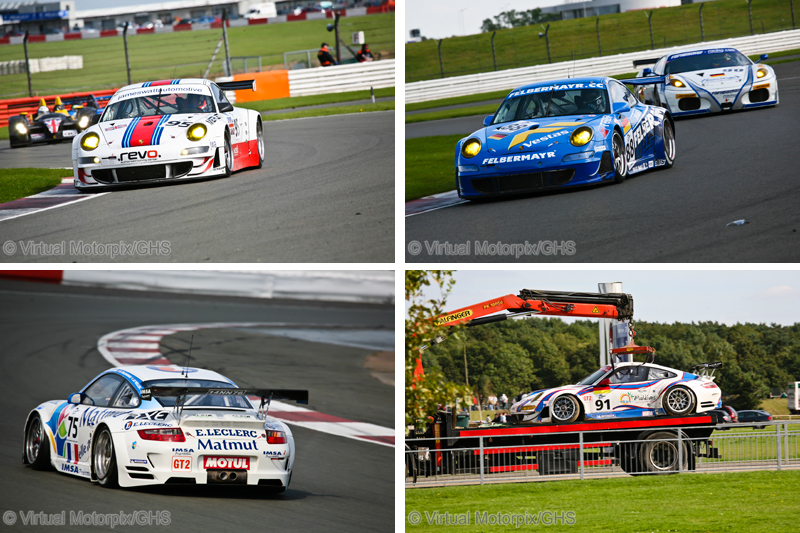 Autosport 1,000km, Silverstone: (top left) The #95 James Watt Automotive Porsche 997 GT3 RSR driven by Paul Daniels/Matt Griffin/Peter Bamford did not finish. (top right) #88 Team Felbermayr-Proton Porsche 997 GT3 RSR driven by Christian Ried/Horst Felbermayr, Jr./Horst Felbermayr, Sr. finished in 30th place. (bottom left) Richard Balandras/Michel Lecourt in the #75 Imsa Performance Matmut Porsche 997 GT3 RSR posted a DNF. (bottom right) An off by Lars Nielsen/Dirk Werner in the #91 Farnbacher Racing Porsche 997 GT3 RSR resulted in them also posting a DNF. The 911 GT3 RSR featured a 3.8-litre engine developing 465bhp at 8000rpm when fitted with a pair of 29.5mm restrictors was in use again for the 2008 racing season. 35 of these race cars were built at Weissach in 2008 and weighed in at 1,225kg for the ACO regulations, and 1,200kg for the FIA regs. The 911 GT3 Cup S model however featured a 3.6-litre developing 440bhp at 8000rpm. The car’s weight was 1,170kg. The 911 GT3 Cup for 2008 was also powered by a 3.6-litre engine producing 420bhp at 7500rpm, but weighing just 1,130kg, the Cup was capable of doing 290km/h. Held in late summer, the Autosport 1,000km at Silverstone on 14 September 2008 was a real storming affair. As Audi and Peugeot battled for championship superiority on the track in superb dry weather, the spectators enjoyed a truly gripping race. The #77 Team Felbermayr Porsche of Alex Davison/Marc Lieb finished 2nd in the race and in the championship in 2008. If you enjoyed Part 1, be sure to check out Part 2 which will follow in due course. If this is just scratching the surface, being a Porsche historian must be a full-time job! Well documented, photographed and written, Glen.